I got my 1st Daith piercing two years ago on my birthday because I had heard that it might aid in the prevention of migraines. I was skeptical of course, but I went in to it thinking that even if it didn’t work at least I would have a cute piercing. Fast forward two years, and I just got my other ear pierced. 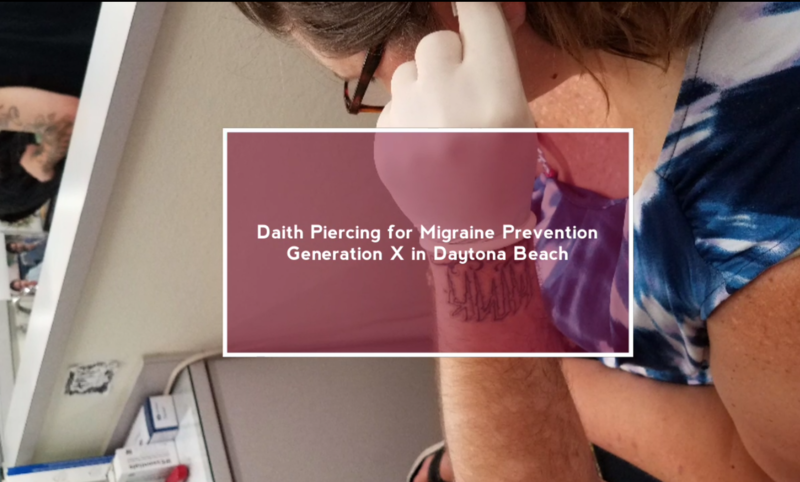 With my upcoming surgery I’ve been a little worried that the migraines will start coming on more often, so I heard about a special that they had this weekend at Generation X in Daytona Beach and knew that I needed to go. If you have been considering it, I will tell you that absolutely has worked for me. Since I got my first piercing I’ve had less than 7 migraines and only 2 of them have been to the point of being debilitating migraines as they were in the past. It’s extremely painful while they are doing the actual piercing, but the pain only last a few minutes and then it’s more of a dull ache. I asked one of the girls there to take the video for me and I think she got some great shots showing the process. All in all, if you have been considering it, I would highly recommend it. Good luck!